Relax at Langs is a downstairs 2 bedroom Langs Beach holiday apartment. With a beachside position, this cosy beach base is an ideal option for a Bream Bay hideaway! This Langs Beach holiday apartment includes easy care and compact open plan living... Enjoy gorgeous views out to the ocean from the living area, or make the most of the beach scenery from the sheltered deck and BBQ area - this is a perfect oasis in the heat of summer! Bedroom 1 at this Langs Beach accommodation is fitted with a King bed, while bedroom 2 has a King Single bunk set - this is a great option for couples and families! 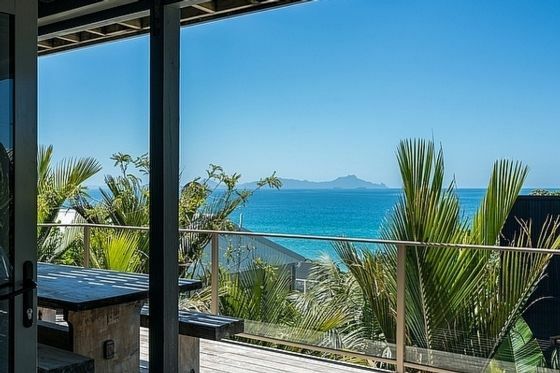 When you are not unwinding on the deck, stroll down to the sand and surf, or set out on adventure with plenty of beautiful locations to visit nearby - Waipu Cove is a 5 minute drive, or head to Uretiti Beach within 15 minutes or to Ruakaka within 17 minutes. Your beach getaway awaits, head to the bay and Relax at Langs! *Please note that the upstairs apartment may be occupied during your stay. Accommodation as advertised... immaculately clean, great position and lovely views. We really enjoyed our stay at Langs Beach. The rental was very clean and had everything we needed for our stay. We had come from Canada so didn't have our own linens, and Jodie was kind enough to lend us some. And thanks for the fresh eggs and herbs, Jodie! Much appreciated! We loved the deck, with it's ocean views. There is a short path down to the beach and it's a great beach to swim at. Our daughter even did some surfing there. Quick 'n easy process - Bach was tidy and comfortable. Quick 'n easy process - Bach was tidy and comfortable. Outdoor shower was absolutely amazing. Will definitely book this place again. We loved our stay at Relax at Langs, nothing better than unpacking and sitting back looking at that view! Quick walk to the water for a swim or walk along the beach. We were absolutely stoked with the bach set up, the non fuss, easy going, made the stay home away from home pleasurable. Great location, kids loved the beach and rocks.